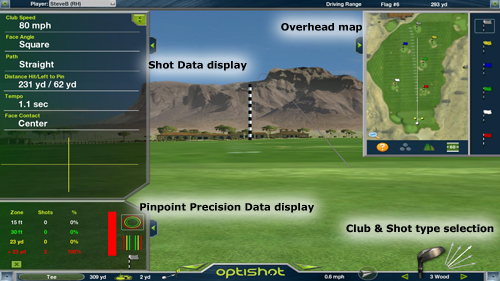 This section describes the visual displays and tools within the OptiShot interface. Below are detailed descriptions of the different displays you will see as you use OptiShot. Some of these are used solely to display information, others you can interact with to change aspects of the game. These interactive tools are detailed in the How To Use OptiShot section. When you enter OptiShot, either in Game Mode or Practice Mode, you will find yourself standing at the tee of the first hole looking down the course. Surrounding the screen are tools and information. We will discuss these as we go along. Across the top and bottom of the screen are the OptiShot Taskbars. The upper Taskbar displays the current player, the current course, hole, yardage and par. In Practice Mode you can change players. In Game Mode the current score will appear in this Taskbar as well. Note: At each end of the Taskbars are the Menu buttons. These allow you to open the function specific menus and allow you to change some of your settings. We will talk about these in detail in the How To Use OptiShot section. On the right side of the screen you will see the Overhead Map. This map gives you a bird's-eye view of the current hole from tee to green. It shows you the current position of your ball as well as the aim line for your current lie. When in Game Mode with multiple players it will show the ball position for each player. As you ball moves down the course, the map will zoom in to display from your current position to the flag. You can zoom back out using the magnifying glass in the lower left corner. 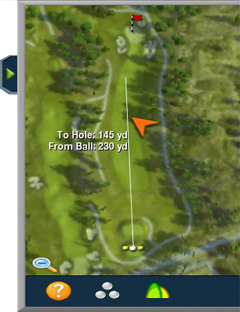 There are two other icons for modifying what is displayed in the course view and in Practice Mode the Overhead Map allows you to position your ball. We will talk more about these in the How to use OptiShot section. Note: When Practicing on the Driving Range this map will appear slightly differently. This will be covered in the Driving Range section. 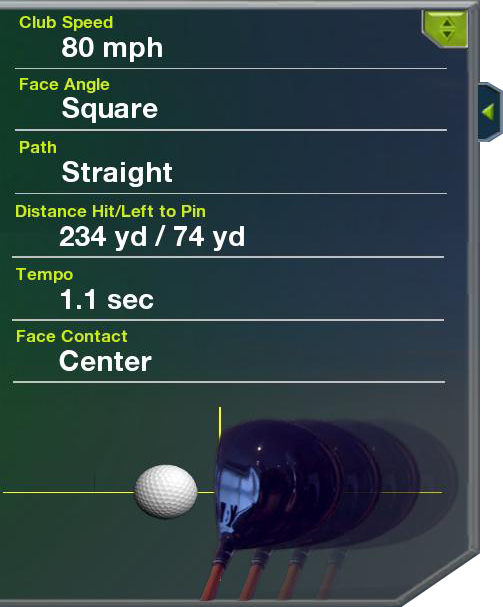 You can also use the Overhead Map to determine distance from the Tee and to the cup. When you move the mouse cursor over the map it will display how far that point is from the Tee and cup. The Shot Data display is an overlay on the left side of the OptiShot screen and shows detailed data about the last shot taken. The speed of the club head at the moment of contact. How far in the ball traveled and how far to the pin. Angle of the club in degrees and open or closed. The path of your swing, such as straight, outside in, or inside out. The time it takes for the club to return to strike the ball from the take away. Indicates where on the face of the club the ball was struck. Additionally, the Shot Data can include a visual representation of the shot taken. There are three different ways to view the Shot Data display. This shows all of the available data and the visual representation. This show the data but not the visual. This shows the visual display and only the Speed and Face Angle. You can set when you want this data to be shown in the Options Window which is covered in detail in the How To Use OptiShot section. When you are near a green, a Putting Grid will be visible around the cup. This is a color coded grid showing the slope of the green intended to aid you in placing your shots. Where the ground is sloping upward the grid will be red, if sloping downwards it will be blue, and where the ground is level it will appear green. Using these visual clues you can aim your shot accordingly. The Putting Grid: Without Rolling Balls and with Rolling Balls. In addition to the Grid display, OptiShot will place Rolling Balls around the grid that will roll in the direction your ball would at that point on the green. The combination of these makes it very easy to see the contours of the green and determine the best aim line for your shots and putts. Note: You can optionally show or hide the Rolling Balls, or even hide the Putting Grid entirely. See the How to Use OptiShot section for details. 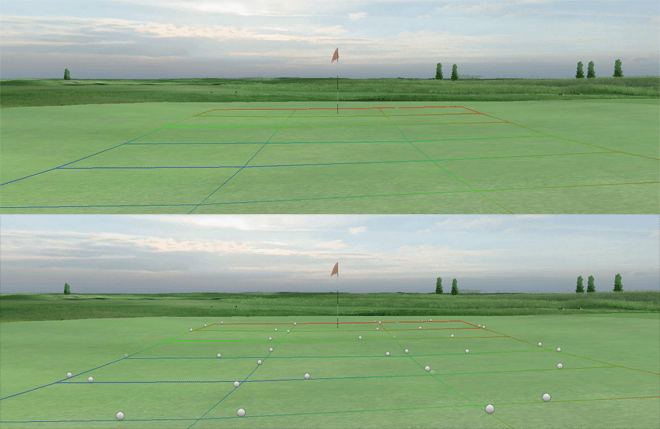 If your lie is within the grid, changing your aim causes the Putting Grid to move with you. If your lie is outside of the grid, when you change aim the grid will remain centered on the cup.